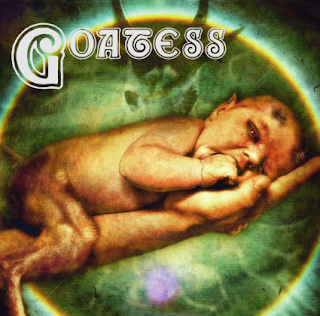 A quick glance at the cover of the debut by Goatess conjures images of the infamous devil baby of Sabbath's Born Again. But a closer look reveals this to be no ordinary spawn of Satan. Note the hind legs. What you have here is the birth of the great god Pan, and while it is an obvious nod to the the founders of the genre we all hold so dear, just as the cover differs, so does the sound of the mighty Goatess. Goatess are more than a doom band. They offer a healthy doss of Stoner groove in most of their songs. And I know, I know, the genres aren't light years away from each other, but the quickening of the tunes goes a long way for those who might shy away from modern doom and its hypnotic thud. Goatess could be a genre unto themselves: Gateway Doom. The first tune, Know Your Animal, sounds like Ozzy when he isn't trying so hard to sound like the Prince of Darkness. The track even name checks an underrated Sabbath tune. Alpha Omega is a more traditionally Doom tune, the sonic equivalent of Michael Myers walking towards a hapless sitter. But something happens at the the four minute mark, a stonery guitar solo pops up, and if I were keeping with my original slasher analogy, I'd mention conscience here, but the plodding begins again and we are bathed again in Doom so why bother. Oracle Part I is the shortest tune on the album, clocking in at a measly four minutes, forty seconds. This tune again showcases the bands commanding dominance of the doom Stoner/Doome genres- it is just slow enough to be Doom, but interesting and compelling enough to be considered Stoner. King One again walks the Stoner line, and the first vocalizations you hear is a cough like a song I think I heard once before. The nods to Sabbath are understandable, and like with any band that plays heavy music it is fun to play the game "Spot the Sabbath", cause there ain't a damn band out there that wasn't influenced by those lads from Birmingham. And maybe the whole thing is just a game we reviewers play cause we got nothing better to do. Who knows. But if something needs to be printed on a sticker and slapped on the album's front I'll say this, "Goatess are both student and teacher of Stoner/Doom Rawk. They preach the old and practice the new. Buy this." I'll end by saying you're not wrong if you think this albums sounds like, say, Count Raven or Lord Vicar, or even a Saint Vitus album,like the Don Dokken produced album C.O.D.There IS a common thread you can investigate on yer own. But after referencing those bands and listening to this album, I believe this band will prove to be on par with those legendary bands. Listen to the track below and find out for yerself. Then buy a physical copy cause this one is worth it. "Life is a motherless child"
This review is true to its word. Goatess are brilliant.